In Atlanta, nearly 600 people benefited from the nearly $2,400 in donations, including frozen turkeys, nonperishable items and monetary donations during the two-week drive, which ran from November 1 to 15. This donation provided food to 600 individuals. “It is such a joy to see so many people participate – from team members and trade partners to our homeowners,” said Beth Stitt, purchasing analyst with David Weekley Homes and member of the CARE team. 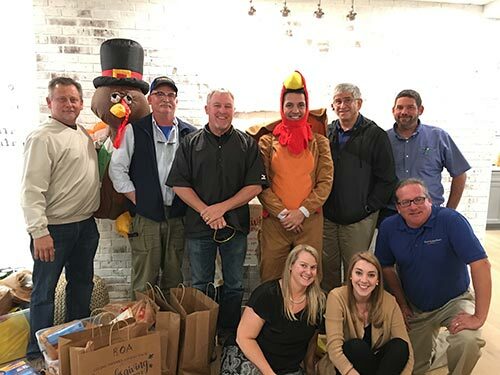 Locally, the Thanksgiving Drive benefitted MUST Ministries, a volunteer-driven organization that addresses the basic needs of individuals, families and children with facilities in the Cobb and Cherokee counties and programs in numerous other counties. David Weekley team members delivered the collected items to MUST Ministries to distribute to families in time for the holiday. The Thanksgiving Drive is an initiative of the company’s CARE program, which joins team members with homeowners, homebuyers, community partners and local nonprofit organizations to live out its purpose of Building Dreams, Enhancing Lives in each of the communities in which it builds. MUST Ministries is a volunteer-driven organization that addresses the basic needs of individuals, families and children with facilities in the Cobb and Cherokee counties and programs in numerous other counties. MUST brings people of many faiths together to minister to others with compassion and love, without judgment of the beliefs, background or circumstances of those who serve or are being served. Team members from David Weekley Homes donated nonperishables and food items to MUST Ministries to benefit families in need.